The Carpatho-Rusyns of Pennsylvania: ASEEES Convention 2017: Sha-mokin' in Chicago! ASEEES Convention 2017: Sha-mokin' in Chicago! The 2017 Annual Convention of the Association for Slavic, East European, and Eurasian Studies (ASEEES) was held in Chicago, Ill., from November 9-12, 2017. The Carpatho-Rusyn Research Center sponsored a roundtable discussion, “Transgressing Identity: Choosing (Not) to Be Carpatho-Rusyn,” on Nov. 9. When one of the scheduled panelists, Janet MacGaffey, was not able to attend, chairman Nick Kupensky (a faculty member at Bowdoin College) invited me to participate with him in the discussion of the aspects of the roundtable theme found in MacGaffey's book. Unfortunately I too was ultimately unable to attend the convention, but I prepared detailed historical and demographic information to accompany his portion of the roundtable discussion. 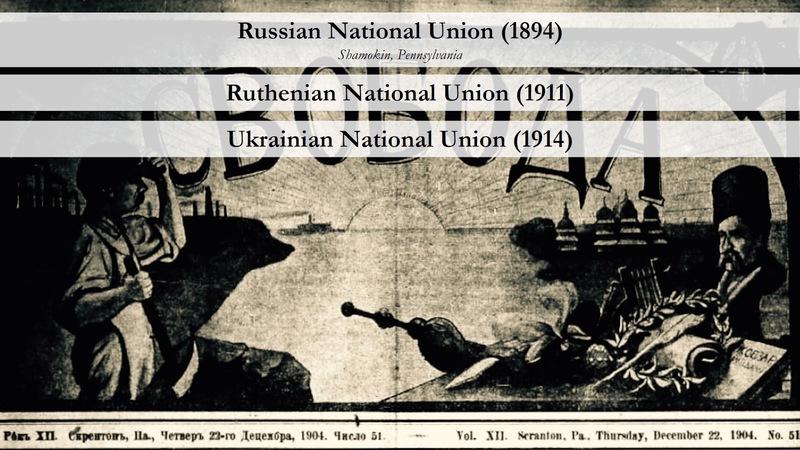 What is the role of the scholar when working on individuals or groups who (1) were but are no longer Rusyn, or (2) could potentially be Rusyn but have never identified as such? Kupensky's portion of the roundtable discussion, and some of his slides, are included here. 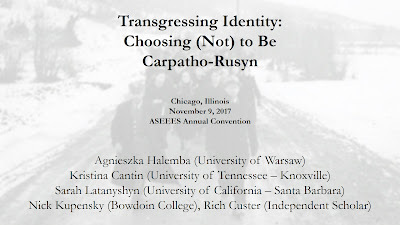 Kupensky: Because the conference theme of ASEEES this year is transgressions, for many of the Carpatho-Rusyn community, one of the most transgressive acts that one could commit or fulfill is to opt in to or out of Carpatho-Rusyn identity. Often the language that’s used when an individual or community becomes Carpatho-Rusyn, or chooses not to be Carpatho-Rusyn, the discourse is often very telling. Often times it echoes a type of spiritual language of conversion that a particular group at last converted to the true thing. Other times the language that is used to describe when a particular individual or group shifts to Carpatho-Rusyn identity, other times it echoes language from a type of sexual orientation. That this individual “came out” as Carpatho-Rusyn, they always were Carpatho-Rusyn, and now they're out of the closet and happy to tell everyone. It’s no secret that Carpatho-Rusyns have had a fluid and malleable sense of self, having been forced into negotiating religious divisions, ethnolinguistic divisions, and spatial divisions. As a result, many communities who at one point identified as Rusyn have dropped off the map. But at the same time, other Rusyn communities who previously had been lost, like the prodigal son, have since been found in the years since the fall of the Berlin Wall and the collapse of communism in Eastern Europe. So the task that we have before us today is a number of different questions about how to speak about these fluid identities within the Carpatho-Rusyn communities. Specifically, Rusyn communities who have left the Rusyn movement for one reason or another. 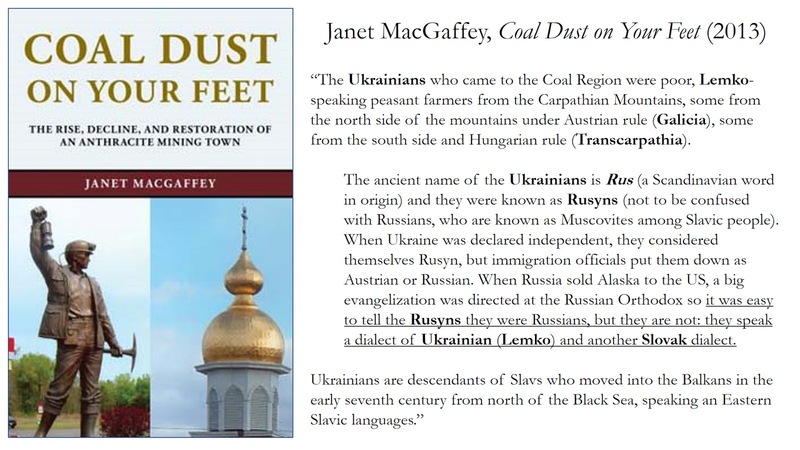 One of the panelists who was supposed to be on our roundtable, who unfortunately couldn’t be with us today, is Janet McGaffey, who worked on one group of formerly Rusyn-Americans who became Ukrainian-Americans in central Pennsylvania. Because Janet wasn't able to be at the roundtable, I wanted to summarize her work, or reference her work, in conjunction with work that I’ve also done in central Pennsylvania to raise a number of conceptual questions. Being a humanist myself and not a social scientist, I’ll raise a number of conceptual questions that I hope this panel of illustrious social scientists will answer, for me, and for us. 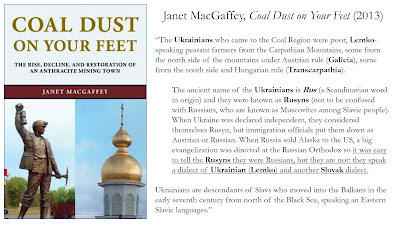 When speaking about the Rusyn community, various types of Rusyn-American communities, one of the places that you could look, and one of the earliest Rusyn communities in the United States is in Pennsylvania’s coal region. 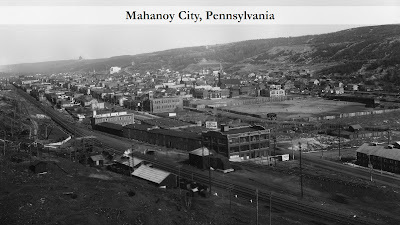 The particular city that I work on is Mahanoy City, Pennsylvania. 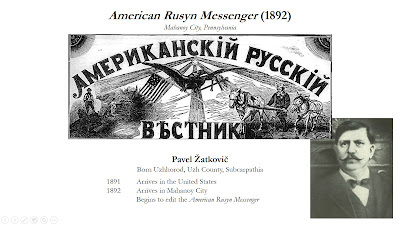 The first wave of Carpatho-Rusyn migrants to the United States came to work in Pennsylvania’s coal mines. At first these communities were largely cohesive. They lived in the same neighborhoods, they worshiped in the same churches, they worked in the same mines. These communities eventually grew fractured for a whole host of reasons, with many of these Carpatho-Rusyn immigrants either actively rejecting Rusyn identity, while others being the passive recipients of the choices of their forefathers. To illustrate this, I want to briefly compare two coal mining towns within the coal regions. 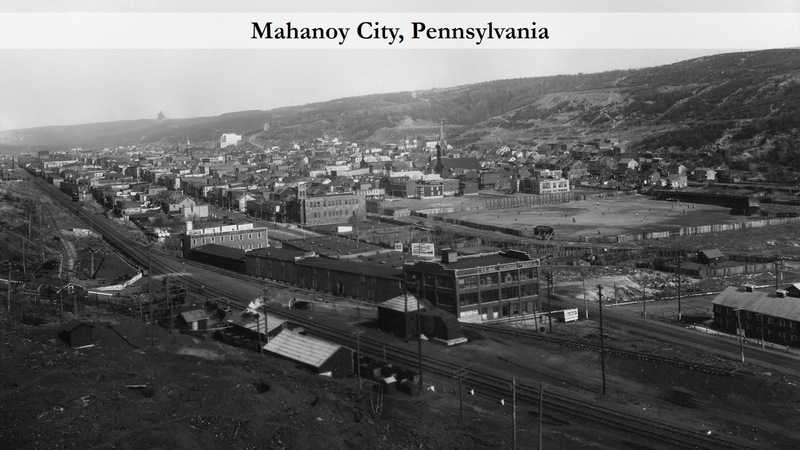 So, Mahanoy City, and the city of Shamokin, Pennsylvania, which is a city that Janet MacGaffey worked on. 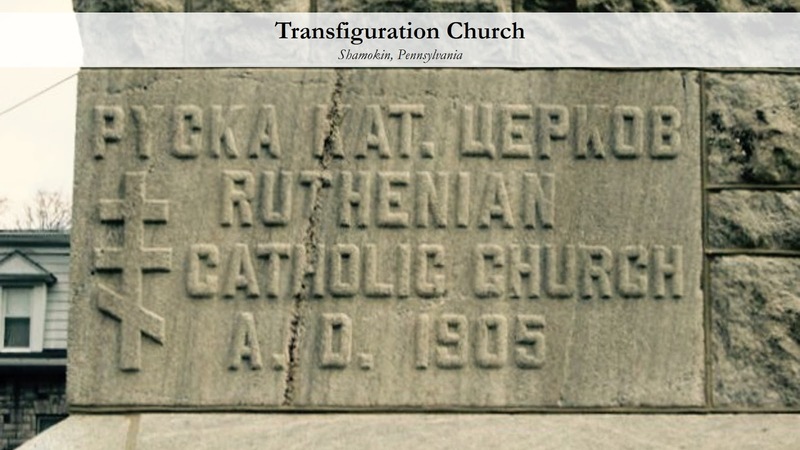 The majority of Mahanoy City’s Rusyns came from the Hungarian Kingdom, south of the [Carpathian] slopes, which gave their church, their social organizations, and their literary institutions a distinctive Magyarone quality. For example, St. Mary’s Byzantine Catholic Church, in Mahanoy City, was founded by John Žinčak Smith, who was born in Zemplén County, in the Hungarian Kingdom. John Smith also was the first president of the Greek Catholic Union, and in the late 1800s and early 1900s, the Greek Catholic Union also was primarily an organization that was populated by Rusyns from south of the slopes. Since Smith was the first president of the Greek Catholic Union, Mahanoy City also was associated with the organization. 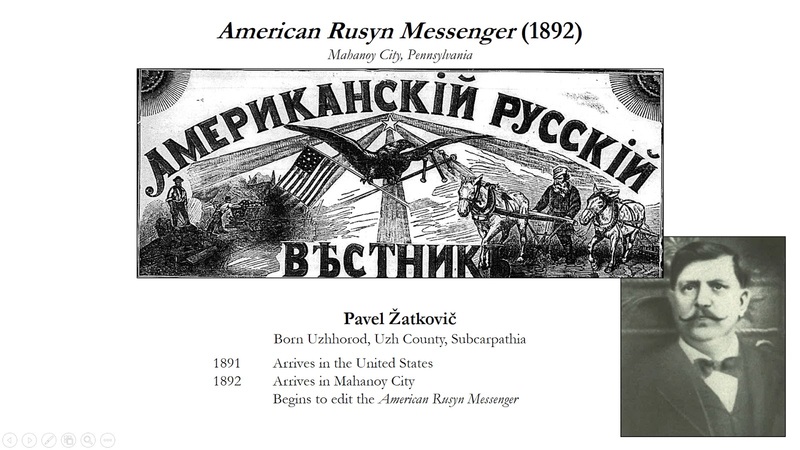 The mouthpiece of the Greek Catholic Union was the American Rusyn Messenger, which was edited and largely written by Pavel Žatkovyč who also was from south of the slopes, from Užhorod. For Lemko Rusyns from Galicia, these churches, the mutual benefit organizations, and the newspapers had too strong of a Subcarpathian and often Magyarone orientation. So they created their own. 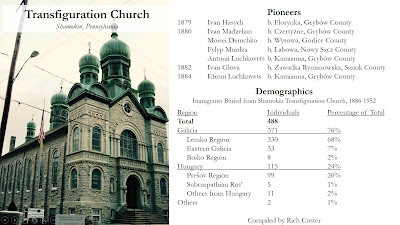 In 1894, a group of priests [and laypeople] from the Lemko Region [and a few Subcarpathians] created the Russian National Union in Shamokin, Pennsylvania, which is just a short 20-30 minute drive west of Mahanoy City. The Union’s newspaper eventually was published in Shamokin as well, which was Svoboda. After briefly changing their name and orientation to the Ruthenian National Union in 1911, Shamokin’s Rusyn community became dominated by a small minority of outspoken Galician Ukrainians*, and eventually changed their name to the Ukrainian National Association in 1914, even though the vast majority of Shamokin’s Rusyn community, or Shamokin’s Ruthenian community, let’s say, was from Lemkovyna, and thus Lemko Rusyn. To prove this I reached out to our house Rusyn demographer, Rich Custer, who gave me some data about this, to illustrate this point. And thus, the church itself became a Ukrainian church. You could even see this if one’s looking at the inscriptions on the church. The cornerstone says Ruska Kat[olycka] Cerkov, the translation of which is “Ruthenian Catholic Church AD 1905,” but if you step away from the church there is a new sign that is installed. It’s difficult to see but it’s down here and it says “Transfiguration Ukrainian Catholic Church.” So the further that you move away from the founding of the church the more Ukrainian it gets. If you go close to the founding of the church the more Rusyn it gets. So today Shamokin’s Rusyn community has, in effect, been functionally Ukrainian for over 100 years but the conversion is not entirely complete. A retired anthropologist from Bucknell University, Janet MacGaffey, whose primary subject and specialization is Sub-Saharan Africa, wrote a book about Shamokin’s ethnic community after her retirement. 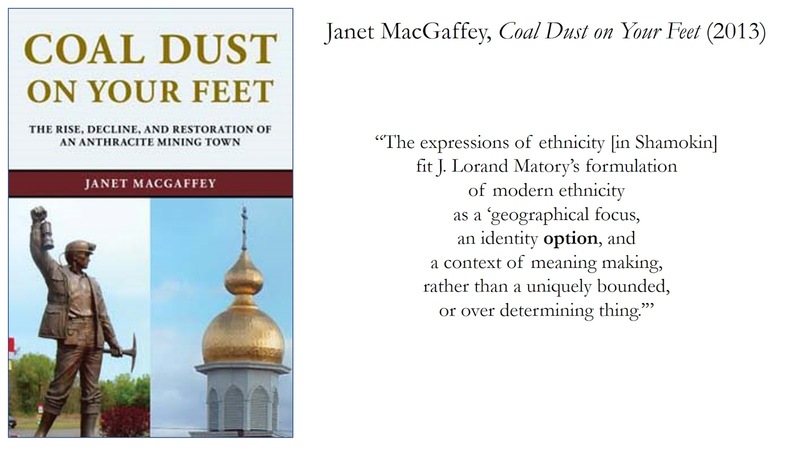 She became fascinated by Pennsylvania’s coal region and wanted to look at ethnic identity in these places. She herself was not trained as a Slavicist or an anthropologist of Slavic peoples. Just as the ethnic identity of Shamokin’s Rusyn community was a bit confused and convoluted, Janet’s own ability to sort of negotiate with her sources produced a number of problematic moments. There is just a lot going on here. Her source begins with the assumption and the truth in Shamokin that the people who live there are Ukrainian and identify as Ukrainian so he begins as Ukrainian. Then immediately qualifies his language as being Lemko so there’s this awareness that he’s something other than Ukrainian. Kristina Cantin: Who’s that quoted from? Kupensky: So the indented section is one of the individuals who lives in Shamokin and the non-indented section is Janet MacGaffey’s prose. 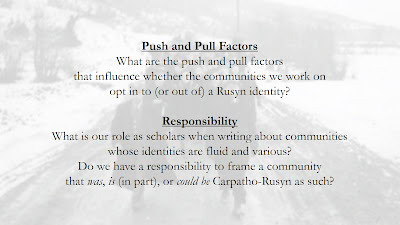 Then there is a second question that came out of this dialectic between Janet’s work and my work, which is, “What is the role of scholars when writing about communities whose identities are fluid and various?” Do we have a responsibility to frame a community that was, or is, or has been part, or could be Carpatho-Rusyn as such? So do we have a responsibility to insist that this community could be Rusyn if they wanted to be, like the Shamokin Rusyn community, because they were Rusyn at one point and then sort of moved away from it and now identify as Ukrainian? This question might perhaps be too naïve of one but this is precisely why we have a panel of distinguished social scientists. After the other roundtable participants had finished, there was a short period of discussion. The comments pertinent to Kupensky's portion follow. Paul R. Magocsi: There’s, I think, another problem, and it’s a conceptual one, and that is we’re really talking about two different things. Everything you’ve been talking about are two different things. What are those two different things? That is, on the one hand you’re talking, or some of the presentations dealt with, the experience of people in the United States in an immigrant society who are governed first and foremost by nostalgia. The vast majority of the people that we’re speaking about have absolutely no direct contact with the land that they’re nostalgizing about. What you’re talking about is people who have memories. Those memories were created at various time frames derived from parents or grandparents, or themselves after having come here at various time frames. This is one continual mixed level of a nostalgia trip. To speak and try to analyze that, compare and contrast with the homeland where you have real people in real time facing questions on a daily basis in which, correctly, as Dr. Halemba stated, the national question, if you will, for the vast majority of them being thank God, “normal people,” is irrelevant. By the way, it’s always been irrelevant, and one might say that having an anational attitude is an identity. It’s a specific Carpatho-Rusyn way of expressing it, so whether you want to call it a national identity or just an identity it doesn’t make a difference. It is. That’s their identity. I don’t know when in history the populations there had a clear national identity, and couldn’t care about it, actually. That is the norm, but I think the real problem is here: One always must keep in mind that the immigrant experience is something entirely different from the European experience. Do not mix them up. Do not try to make comparison and contrast analysis because you’re never going to get anything out of that. You’re talking on two different planes. That is what I wanted to add to the mix of discussion today. Maria Silvestri: A quick question because you all did a wonderful job in your own ways of talking about these push/pull things, but if I could ask Nick to remind us of the second question, which is really where the difference between you as social scientists and most of the rest of us in humanities-based disciplines, this is where you have something to tell us. If Nick could remind us of what your second question to the panel was from the beginning? I know we don’t have a lot of time, but if you would briefly discuss that, I think that’s where you have something really to give the rest of us. I think it was about a responsibility. Magocsi: One of those identities. 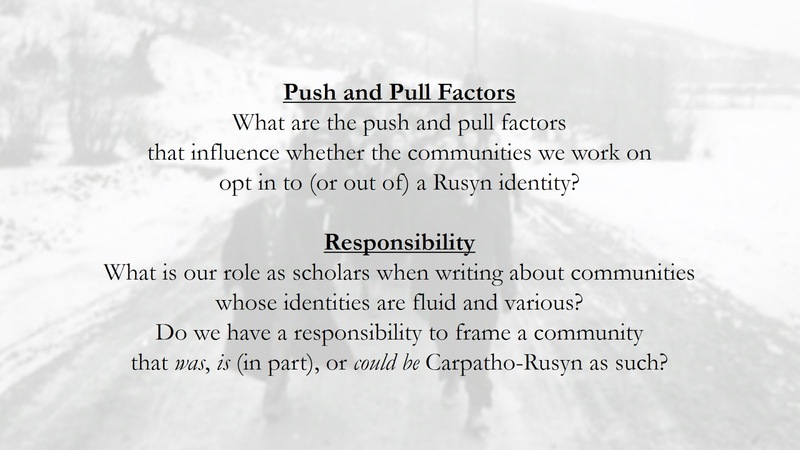 Kupensky: —one or a multiple of those identities, which is to come up with some sort of clearly articulated sense of what a Rusyn is and place her respondents within that framework. Cantin: Alternatively, you could use Ukrainians as an example as well in this same context. Cantin: To come back to your point, I would say that the best scholarship is going to articulate as much of the context as possible. It’s irresponsible to only say Ukrainian if that’s not really the full story, in a, say, historical context. But it would also be irresponsible to only say Rusyn and to not include the Ukrainian piece because that came into being and people are using that. I think it's important to make sure that people are heard in their own voices and that as scholars we try to contextualize that both sympathetically and critically. We’re balancing being sympathetic to how people are located in particular situation because we all have very different family trajectories, class trajectories, times when we came places, whether families were removed or not, where they were removed to, whether they had a positive experience and were immigrating for positive reasons or not. All of that has impacted and I don’t think none of us really got into some of those. To not give credence to people’s really felt and experienced stories, that’s not responsible but it’s also not responsible to put those into a larger context about the geopolitical, the church politics. All of the different factors that have pushed or pulled us one way or another. *More specifically, these leaders were Lemkos who had, or who adopted, a Ukrainian national orientation. While I regret not being able to have attended in person, I found the questions posed and the discussion around them to be incredibly relevant and useful to my study, analysis, and writing, such as “What is the role of scholars when writing about communities whose identities are fluid and various?” Indeed, a substantial portion of “the Carpatho-Rusyns of Pennsylvania,” to quote Kupensky, “were Rusyn at one point and then... moved away from it and now identify as Ukrainian;” am I justified in including them in my work? ...the experience of people in the United States in an immigrant society who are governed first and foremost by nostalgia. The vast majority of the people that we’re speaking about have absolutely no direct contact with the land that they’re nostalgizing about. What you’re talking about is people who have memories. Those memories were created at various time frames derived from parents or grandparents, or themselves after having come here at various time frames. ...One always must keep in mind that the immigrant experience is something entirely different from the European experience. Do not mix them up. It is precisely the distinct and different nature of the immigrant experience of these people that enables the treatment of this particular ethnic community, and its diffused sub-communities, across the board as from a single source, a single ethnos. Thanks to roundtable chairman Nick Kupensky for sharing and permitting the posting of the presentation materials and the transcript. Thanks to Maria Silvestri for recording the session and providing the transcript. An important consideration in self-identification of Carpatho-Rusyns in America was the fear of being labeled Russian at a time when Lenin and Stalin were wreaking havoc. My Carpatho-Rusyn grandparents told outsiders they were Slovak in order to avoid being ostracized, due to the unfortunate similarity in the ethnic names Rusyn and Russian. I believe it's fair to say that Russians and Ukrainians happily muddied the waters. This is an excellent point. My father always told me to tell people I was Slovak in the 60s growing up - at a time when the Cold War had people scared of Russians. My grandmother OTOH, whose accent was extremely heavy, always reminded me I was "Ruthenian/Ukrainian".